This 250,000-square-foot expansion project provides a state-of-the art, dynamic community hub for students, faculty and the entire community, relegating the very idea of dorm living to the dusty pages of old college yearbooks. 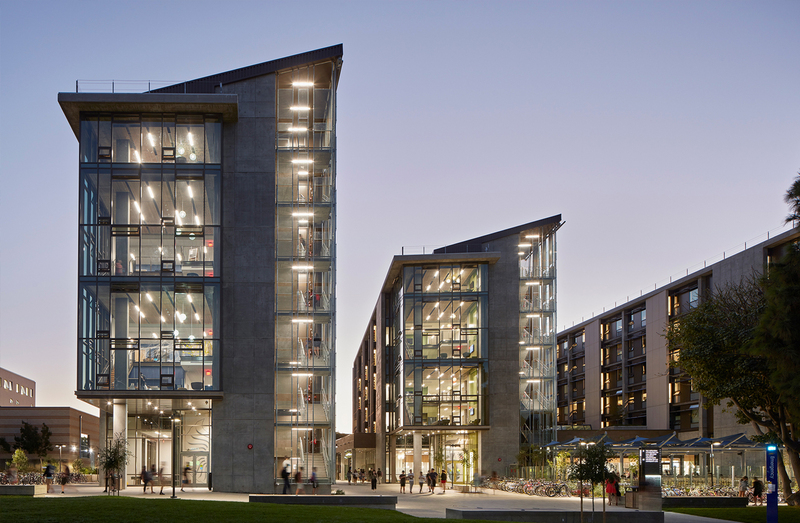 UC-Irvine has been an industry leading campus in the design-build delivery method for decades. Likewise, Hensel Phelps has found great success in design-build for a wide variety of clients and diverse building functions. Design-build is UC-Irvine’s preferred delivery method due to its unique ability to foster creativity in design while maintaining project budgets and schedule. Hensel Phelps partnered with Mithun (Architect) and UC-Irvine Design & Construction Services to provide an attractive landmark facility with a sustainable design while meeting the needs and expectations of the UC-Irvine Housing Department, all while staying on schedule and within budget. Completion of Mesa Court Towers in August 2016 aligned with celebrations of the 50th anniversary of the UCI campus. This high-performance living and learning community has quickly become a beloved heart of the Mesa Court neighborhood. The 250,000-square-foot development is an attractive, long-term housing solution for the University and draws students who hadn’t or couldn’t previously consider on-campus housing.